A bequest is a gift of personal property named to a beneficiary under a Will. Personal property includes any asset, finances or personal belongings. The Will specifies the terms on which the bequest is made, in particular, the purpose of the gift. When you make a gift to Habitat for Humanity SA, you become an integral partner in the mission of building strength, stability and self-reliance through shelter. You can make a gift in your will, trust, or other account that becomes your personal legacy of improving livelihoods for generations to come. Leaving a bequest offers you an opportunity to empower low-income South African families to break their cycle of poverty without immediately affecting your own life in these financially challenging times. The decision to remember Habitat for Humanity SA in your Will, estate plan or other long-term financial arrangement is a powerful commitment and will be long remembered, as this contribution to our community development will continue to make a difference. Your gift will effectively provide for families in need with the necessary safety and security of a decent home, even after you have departed. 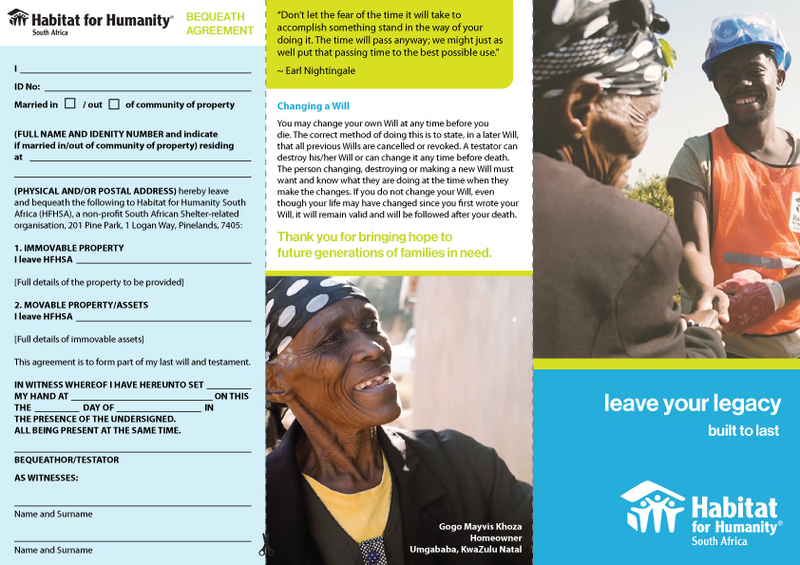 Download a Bequeath Agreement and bring hope to future generations of families in need.